My friends Jenn and Jeff made this awesome feeding box for their new cat Pascal. He is 15 years old and needs to eat in the middle of the night but they have another cat who would eat all the food if they left it out. Jeff bought a large rubbermaid box and a cat door with a magnetic collar and put them together. I think this is genius and I wish he would start marketing these. I know so many households with one very large hungry cat and one very small cat. Jeff has some great photos on his blog of the resulting box and more about Pascal. Here is Pascal’s story. Pascal also recently became a patient of mine and gets acupuncture and herbs for his recently diagnosed renal failure and for night time yowling. Jenn and Jeff have reported back that Pascal’s yowling is much less and he is playing more and seems happier. 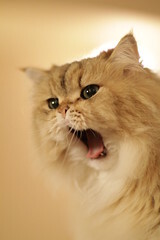 Yowling can be a problem in older cats. In Chinese medicine we say it is often from the water of the kidneys being deficient and not controlling the fire of the heart. Because of this, yowling is common in cats with renal disease. 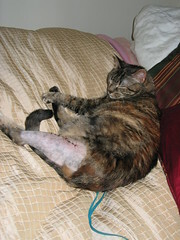 Acupuncture and herbs can be a great tool for treating this in many cats. 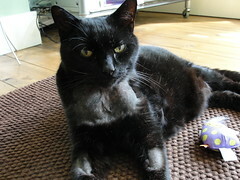 Although unfortunately I had another cat I treated recently where the acupuncture did not help. Night time yowling can also be a sign of thyroid issues which needs to be treated with western medicine. So if your cat is yowling at night the first step is to get blood work run to rule out a thyroid issue. There is a great western treatment for thyroid disorder which involves injecting radioactive iodine which destroys the benign thyroid tumor that causes this disorder. Sounds strange but it is a safe and effective treatment. I have been through it with two of my cats and a number of the animals I work with have had this treatment including Pascal. Food sitting in a dish uneaten does not help a cat get better. In other words, the best food left uneaten does nothing. Yet many cats with kidney/renal disease are put on a low protein diet such as Science Diet’s K/D diet that they will not eat. And from my experience cats with renal disease should not be on K/D or other low protein kidney diets to began with. Many cats get kidney failure as they age, yet western medicine does not have a good treatment to reverse or prevent this disease. The most common treatments involve a low protein diet and subcutaneous fluids. So what do I recommend for cats with renal disease, if you know they do not have inflammatory kidney disease (explained later in this article)? A high protein canned or home cooked diet made with good quality protein. I recommend using Instinct, Weruva, or Go/Now grain free if you use a commercial diet. Raw food is ok if they will tolerate it and are not severely sick. But my vet said I need to feed low protein! Here is one of the commonly sited studies on PubMed that proves that high protein does not make kidney disease worse in cats. So let’s talk a little about what is going on with renal disease and why I recommend the diets I do. From a Chinese Medicine view we have two main types of renal failure, inflammatory and deficient/ischemic. This is the more common type of renal failure. These guys are usually thin, not great eaters and may or may not be vomiting. The inflammatory cats may also shift to this after you get the inflammation down. I really hate to see these guys on K/D or low protein. In this form of renal failure there is not enough blood going to the kidneys and the cells are dying from ischemia (lack of oxygen). They may also have renal hypertension (high blood pressure) which causes even more damage. 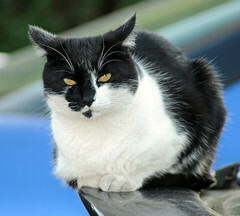 Many of these cats are also anemic making the problem even worse. These cats need protein both to increase blood flow and blood volume (you can’t make blood without protein) and to repair the damage to the kidney cells (you can’t repair cells without protein). And yes many of these cells are not dead and can be repaired once you improve blood flow. I recommend a high protein canned food such as Instinct, or grain free Weruva or Go for these guys. Infrared light therapy can be very helpful for these kitties and can be done at home. Infrared light helps to improve blood circulation into the kidneys and wake up kidney cells that are still alive but don’t have enough blood flow. See my article Infrared light therapy for instructions on how to use this therapy. 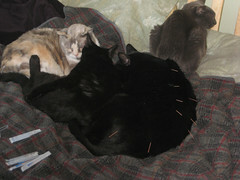 I’ve had many cats convert back to normal through diet, acupuncture and herbs. From my experience, if they stay on K/D, I can not convert them back. They need to be on high protein if they have this type of kidney disease to improve numbers. If they are inflammatory we get rid of the inflammation and then put them on high protein even if the numbers are normal to keep them stable and out of renal failure. Although it is not my favorite approach, I have maintained cats with ischemic renal disease on dry Orijen or high protein/no grain diets. If somehow they have to be on dry I always go with a high protein. They tend to stay stable on high protein dry and sub-Q fluids. I also find sometimes you need a little dry in the old guys. 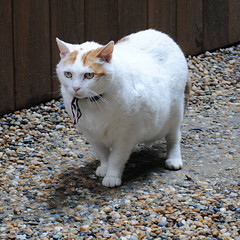 My old cat Basil needs a little dry to maintain his weight because he just didn’t eat enough canned. So why does my western veterinarian recommend a low protein diet? We do know that high phosphorus can be bad in renal disease. There is higher phosphorus levels in protein so it is hard to get low phosphorus without doing a low protein diet. So low phosphorus has translated into low protein. My experience has shown me that the higher phosphorus doesn’t seem to cause as large an issue as the low protein does in cats with kidney failure. 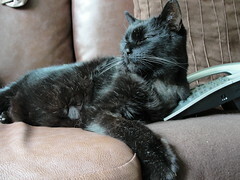 We do not see much inflammatory kidney disease in cats and most of it is in cats younger than 10 years old. In inflammatory kidney disease, there is inflammation in the kidneys that causes the the kidneys to not function well and reduces the blood flow to the cells. 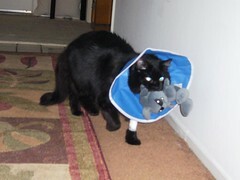 It can be hard to tell these cats from deficient kidney kitties as there is much overlap in symptoms. These cats tend to vomit a lot but still have a fairly good appetite. They almost always have a high cholesterol on blood work and tend to have kidney numbers that are just barely elevated. They also may have a history of inflammatory bowel disease, elevated liver enzymes, chronic pancreatitis or vomiting. And these cats tend to be younger, usually the old thin kitties are not inflammatory. Usually with acupuncture and herbs we can clear this stage up in a month or two. If it is mild and recent their kidney numbers may go back to normal. If they have had it awhile we then see the ischemic renal disease underneath. These guys should not have high protein but also should not have high grain (which causes inflammation). For inflammatory kidney disease herbal treatment can be amazingly effective. 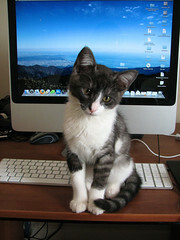 It is best if you can work with a holistic vet to determine the most appropriate formula. 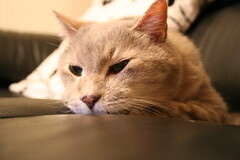 So what do I do if I can’t figure out if my cat has inflammatory or ischemic kidney disease? 1. Find a holistic vet who can help to make that determination.A holistic vet can also help you get your cat on an appropriate herbal formula and do acupuncture to help support the kidneys . 2. If you can’t find a vet to work with, feed a moderate protein canned food. 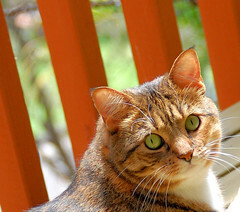 What can I do to prevent kidney failure in cats who are currently healthy? 1. Do not overvaccinate. 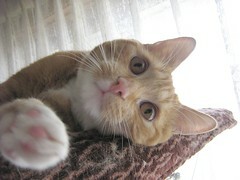 We now know that the FVRCP causes many cats to have antibodies against their own kidneys. See the article To vaccinate or not to vaccinate that is the question. 2. Do not feed your cat a dry food only diet. Make sure your cat is on a high protein, good quality diet of canned food, home cooked or raw food. Cats on dry food only diets are always in a mild state of dehydration. Long term this dehydration can hurt their kidneys. See How do I pick the best food for my cat’s health. It is sad to see our beloved animal companions get old and even harder to see them start to loss their mind. In many dogs the first sign of this is anxiety in the evening or throughout the night, although dementia or cognitive dysfunction syndrome can manifest in many different ways. Not all dementia has an anxiety component to it and not all anxiety in older dogs is from dementia but the two often go together. So what causes dementia in older dogs? There are four main causes of dementia or cognitive dysfunction syndrome. Free radical formation Free radicals harm healthy cells in the brain. Hypoxia to the brain In other words there is not enough blood getting to the brain. Alterations in neurotransmitters There is too much or not enough of certain necessary neurotransmitters in the brain. You need neurotransmitters to have your neurons or brain cells function together. Neural infiltrates such as B amyloid and lipofusion These infiltrates destroy healthy brain tissue, similar to alzheimer’s disease in people. In Traditional Chinese medicine (or TCM), anxiety in older animals is caused by too much heart fire related to the kidneys becoming deficient as your dog ages. Kidneys are considered to be the water element and as we age the kidneys get deficient and water in the body system decreases to a point that it allows heart which is a fire element to flare too much and cause anxiety especially during the heart peak hours of 11pm – 1am. According to TCM, another issue is that older animals can become what is called yin deficient. Yin holds the yang at night so we can sleep. If there is not enough yin, the yang is not held and sleep doesn’t happen. Sometimes these problems are reversible if caught early but even when they are not, there are things you can do to help slow down the progression of the disease and help with symptoms. Usually in spite of everything we do, dementia is progressive and eventually gets to the point that nothing helps anymore. This process can happen quickly or occur slowly over a number of years. Here is a list of some things that I have found can help your older dog with dementia or anxiety. Please check with your veterinarian to come up with a plan that is safe for your dog. Walking is the most important thing you can do for your older dog. Walking just ten minutes twice a day can significantly increase brain blood flow and reverse symptoms of dementia from hypoxia. Plus it can help prevent muscle atrophy and help with arthritis. Fish or Cod Liver Oil and other antioxidants help prevent and repair free radical damage and stimulate brain function. 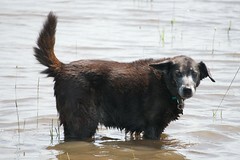 In addition Fish Oil also help with arthritis and dry coat problems in older dogs. I dose Fish Oil at 500mg per 40 lb of dog. I prefer the Nordic Natural Cod Liver Oil. Extra vitamin B and E can also help these dogs. SamE helps increase dopamine function in the brain, stimulates brain function and works as an antioxidant. It also helps with joint pain and liver function which many older dogs have problems with. I dose SamE at around 425mg per 50lb of dog. 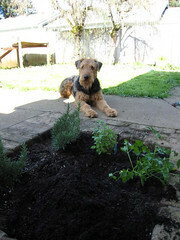 I prefer to use the dog product Nutramax Denosyl . Remove any compact fluorescent or fluorescent lighting. Fluorescent lighting can cause a high pitched hum that humans can not hear but dogs and cats can. 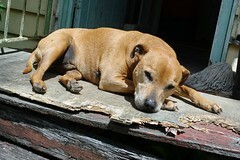 Older dogs loss their high frequency hearing last so even almost deaf dogs can still hear very high frequency noises. In addition fluorescent lighting can affect brain function and can cause headaches. See The danger of compact fluorescent lighting. Get rid of the dry food. 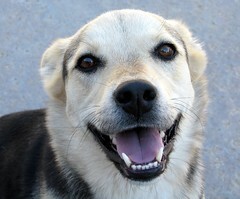 Many older dogs do better on home cooked food or canned food. I don’t recommend switching an old dog to raw food if they have not been on it before. 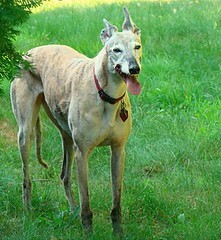 From a Chinese medicine view, dry food is too processed and dry for an older dog who already is kidney deficient. 5.Wearing a T-shirt, Thundershirt , or Anxiety Wrap can help your older dog if they have problems with anxiety. It sounds weird I know, but it actually does work. It is based around the ideas from Tellington TTouch of using an ace bandage. 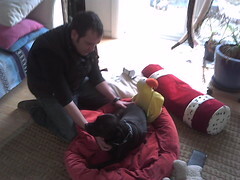 See the article Put an ace bandage on my dog?. Wearing the shirt enhances your dog’s sense of their own body and makes them feel more confident in their movements and behavior. You can use a snug fitting human T-shirt, a Thundershirt , or an anxiety wrap. I have found however that if your dog has a lot of arthritic pain the anxiety wrap is too hard to put on, so try the Thundershirt or a T-shirt in that case. This is also an idea that can work in young dogs with anxiety. Melatonin can help old dogs sleep at night. Sometimes older dogs can get confused between night and day and end up sleeping all day and then pacing and panting at night. This can make it very hard for us humans to sleep also. Giving Melatonin in the evening can help regulate night and day for these guys and get everyone a better night’s sleep. I dose Melatonin at 3-4mg per 50lb of dog.Many brands of Melatonin contains xylitol which is highly toxic to dogs. Make sure your brand does not! Small meals more often and right before bed are sometimes better for these older dogs. A small meal of wet or cooked food right before bedtime can help get these dogs through the night and help them sleep better. Acupuncture can help decrease anxiety especially at night time by treating the yin, kidneys, and heart fire. In addition acupuncture can help with arthritis pain, weakness, and kidney function and help your dog age more gracefully as they get older. 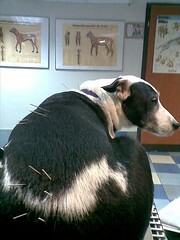 I often combine acupuncture with Chinese herbs for these dogs. 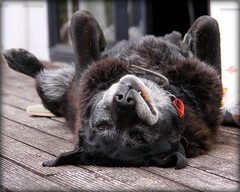 Reiki can help to relax older dogs and calm anxiety. 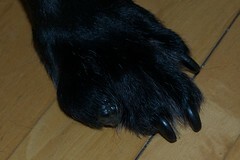 Reiki is a nice calming way of helping improve health and well being as animals age. Bach Rescue Remedy and other flower essences can help with anxiety and fear. Flower essences are homeopathic in nature and very safe for older animals. Rescue Remedy is the best know but there are many lines for treating a variety of behavior and emotional issues. You can dose flower essences by putting 3-4 drops in your dog’s drinking water every time you change their water. It’s ok to use flower essences in the water even if other animals drink from the same dish. 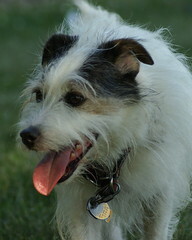 Other herbal medications are out there for helping with anxiety in older dogs. Making a tea or tincture from hops leaves can help calm some older dogs. You can also buy hops leaves and sprinkle them in your dog’s food. Animal Apawthecary makes a Tranquility Tonic that if used at their recommended dosage is safe in most animals. I also have a formula I make and sell in my store, Kingdom of Basil, which helps to treat anxiety in older dogs and also contains ginkgo to help with brain function called Calm and Peaceful Formula. Also see my article Helping anxiety in an old friend – calm and peaceful formula. 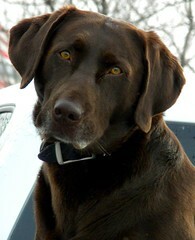 I recommend consulting with a holistic veterinary to decide on what is right for your dog. Some of the calming herbals can be dangerous if used incorrectly or in the wrong animal. To use Chinese herbs correctly you should consult with a veterinarian with a background is Chinese herbal medicine or Traditional Chinese Medicine. Western Drugs are always an option. There are may drugs that help with anxiety and can be given if the natural alternatives do not work or are not enough. There are also drugs out there that help with dementia such as Selegiline (Anipryl). Most of the western drugs like the herbs are not cure alls but can help make things better. Some dogs are anxious because they are painful . This is an important thing to rule out before assuming there is a dementia component. 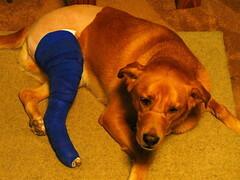 If your dog is not on pain medication have them evaluated by your veterinarian. If they are on pain medication talk to your vet about increasing the dose or trying something else if there may be a pain factor. Dogs can’t always tell us when they are in pain and pain certainly can cause sleep disturbance and anxiety. Talk to your dog about the change in their position in the house. Many dogs especially the herding breeds take their job of watching the house very seriously. As they get older and can not do it the way they would like to anymore they can become quite anxious. Explaining that your accept them in their old age and making changes to help them, can ease anxiety. See the article Love me for who I am today. 13. Take care of yourself!. 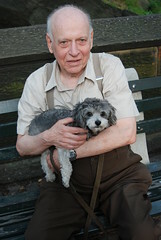 This is very important when you are caring for an elderly or sick animal. To be a good caregiver you need to be healthy and well rested. If you have a dog that is anxious at night and you are not sleeping consider putting them in a different room than you sleep in, crating them if they are ok with crating, or finding another solution. If you get sick because you are not taking care of yourself you will not be able to care for them. It may seem mean to kick them out of your room but it is kinder than letting them sleep with you and being a grumpy caregiver. I had to do this with my old dog Jake and it actually ended up with us both sleeping better. Before we slept in separate rooms, his anxiety made me anxious, which made him more anxious and by the morning we were both a mess. Dementia and anxiety are some of the most frustrating and painful problems I see in older dogs and can be very difficult to deal with. Be gentle on yourself and your dog companion and try to find a healthy way to work with these problems for everyone in the household. When dementia progresses to a point where you beloved companion is no longer present and enjoying life or in pain sometimes the greatest gift we can give them is to help them to go through euthanasia. This is not an easy decision to make and there are no set guilds that tell you when it is time. This can differ from dog to dog. The best we can do is to look into our hearts for what is right. Also see Follow up to Dementia and Anxiety in Older Dogs – Sadie’s Hospice Care. Please join me in the Path With Paws forums for more discussion of dementia and with any questions. Did you know that one out of seven dachshunds will become paralyzed in their lifetime? 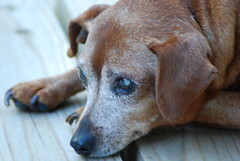 That many older dogs and cats suffer from strokes and vestibular disease in their old age? That seizures are so common in some breeds that they can affect 15-20% of the breed? Neurologic problems are quite common in our companion animals and are some of the most expensive and frustrating problems to deal with. Often times the only way to diagnose these problems is with a MRI, which can cost $1000 and requires your animal to be under anesthesia. Many times in older animals the risk of anesthesia to too great and these problems go undiagnosed. I am often surprised that veterinarians do not offer alternative options for working with these neurologic problems. Many times the only things western medicine can offer are expensive surgeries, a lifetime of drugs, or steroids with their many side effects. For example, traditionally a course of treatment for paralysis, back pain or paresis in a dachshund would include steroids, months of cage only confinement and possibly an expensive surgery. While surgery is a good option in some cases, especially if there is no deep pain, it has it’s own set of risks including that sometimes it does not solve the problem and can actually make things worse. But there are other options out there! Let’s talk about the dachshunds first! I love working with dachshunds! They are some of the best responders to acupuncture out there. In fact I have never worked with a dachshund who did not respond to acupuncture. And they really seem to understand that you are helping them. I have been able to work with dachshunds who were completely paralyzed and with acupuncture and herbs have had them back to walking in as little as three acupuncture treatments! Wow! OK just to be realistic, most take longer than that but the majority can be gotten back on there feet as long as they still have deep pain. Meaning that if you squeeze a back toe really hard with a surgical hemostat they can feel it. On average I would say it takes four to six months of weekly treatments. Of course it’s not all dachshunds and I have worked with other animals with paralysis including cats and all breeds of dogs. Of these others, I would say about 90% have had a positive response. That’s still pretty good! Most of these dogs I also put on a herbal I use called Back Support Formula. Even better is if I can get these animals with paralysis to hydrotherapy. Swimming helps keep the muscles working well while we are getting the nerves to work again and helps keep the muscle mass from wasting away. Dachshunds and other dogs can be amazing little swimmers and it gives these animals a way to move on there own if they can’t support their weight on land. Unfortunately for cats this is not an option as you can well imagine! I often work with Wellsprings in Seattle, Washington but there are more and more hydrotherapy clinics opening up around the world. I can’t tell you how rewarding it is to be able to work with these amazing creatures to help their body to heal and to see them be able to walk again. Handicapped Pets is a great site for disabled pet supplies and runs the best forums for people with special needs animals. I have had some time to hang out and participate on these forums and these folks not only are super educated on the options out there for working with these animals but have amazing stories about their own very loved handicapped companions. It is a great place to go for education and for support from others going through the same thing. One of the dogs I treat has his own blog. 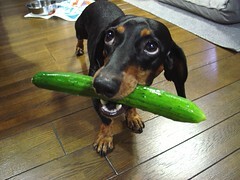 Buddy’s blog is a great place to check out the story of a very cool little dachshund and one of my favorite patients. Soon to come neurologic problems in older animals and seizure disorder.